Red Mallee Burl it is, like #13. But, you know what? This one had all kinds of little cracks on the blank. I dribbled CA and sanded dust into them. And, here’s the whole set all together. I’m done with that, now. Love the swirly burl grain on this one. 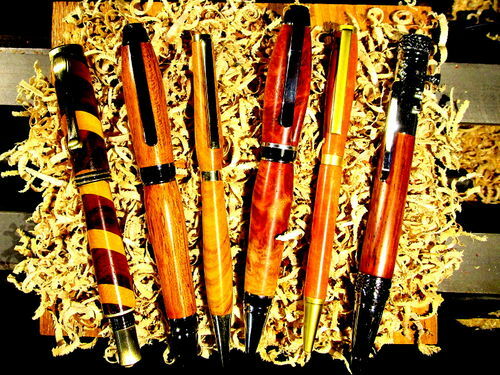 Congratulations – you’ve finished the project and made six distinctive pens – I just hope the recipients don’t fight over them or that RBS was expecting 6 identical pens. Now take a short break – you’ve earned it. great job again buddy,they all look beautiful. That set should fetch a nice price! Very Nice Indeed! & Well Done Mark!